Happy 400 comics everybody! 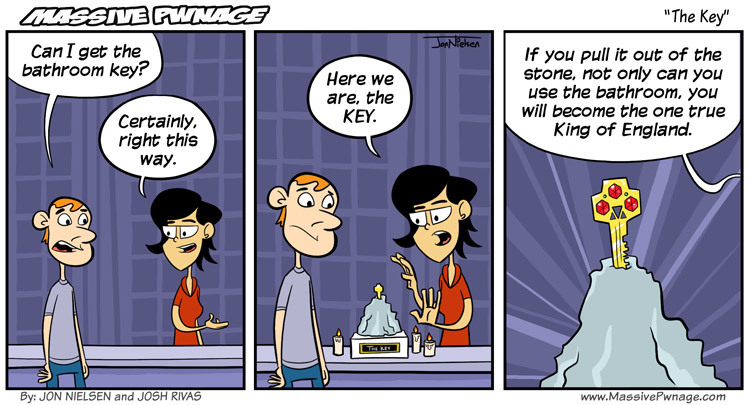 Here’s a comic about a very special key. You’re welcome. This entry was posted on Monday, June 13th, 2011 at 12:00 am and is filed under Comics. You can follow any responses to this entry through the RSS 2.0 feed. Both comments and pings are currently closed. she’s at her new hunting grounds at Locke’s shop, which i suppose has a locked bathroom, a very nicely locked bathroom, and of course this is all Alice’s fault, hmmm speaking of which will Locke be stocking the new alice game tommorow?